A HUGE trend that is spawning evangelists across the world and in Las Vegas more recently, aged cocktails will be introduced here by Bacardi this month. Wea��re talking about complete cocktails aged in barrels, just like whiskey or wine. The technique, pioneered by American bartender Jeffrey Morgenthaler a few years ago, will heighten the flavour and colour of classics and all-new concoctions. Bacardi trade ambassador, Nitin Tewari, who has designed the cocktails using Grey Goose at ITC Grand Chola, swears by French oak, medium toasted, for this technique. Given its exclusivity a�� wea��re talking two to four barrels per hotel, a 10 to 35 day wait and about 27 glasses (90ml) per barrel a��A� no patron is going to begrudge the time taken to fashion these beauties, chuckles Tewari. There are some rules, of course, like no fruit juices and emphasis on regular tasting during the ageing. While The Oberoi in Bangalore has The French Manhattan coming up, made with Grey Goose vodka alongside vermouth, at ITC Grand Chola, ita��s Grey Goose Splendor. 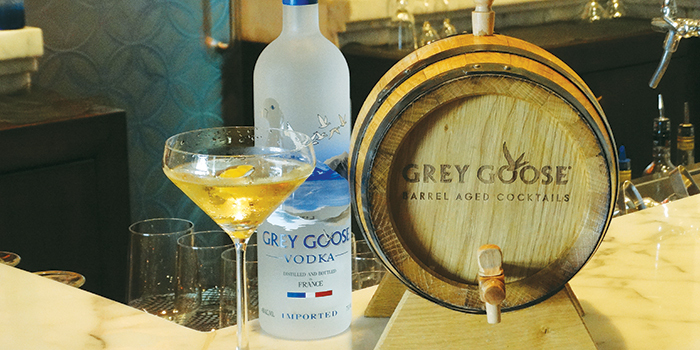 But it appears the most popular cocktail is the Grey Goose Angela��s Share, also featuring Martini Rosso, Cointreau and Campari, and served on the rocks.